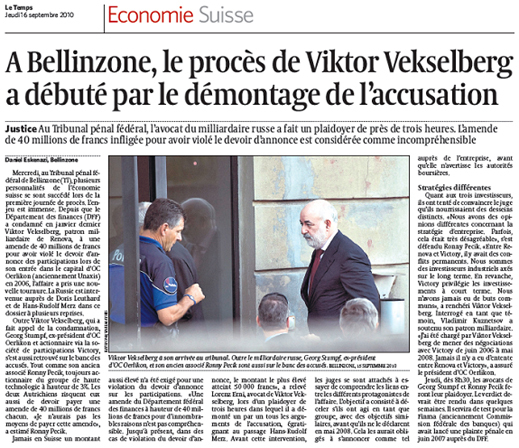 Victor Vekselberg, the chairman of the board of UC Rusal, went on trial in the Federal Penal Tribunal of Switzerland this week, charged with sharemarket violations, and facing a fine of 40 million Swiss francs ($40 million). That, according to the report of Le Temps today (see illustration), is the largest fine ever imposed by the Swiss authorities for stockmarket abuse. According to Vekselberg’s lawyer in court yesterday, whose pleading lasted three hours, the fine “is not comprehensible”. The highest fine he could identify in the Swiss record to date is CHF50,000 ($50,000). Vekselberg is also pleading not guilty of the findings against him by the government investigators. Vekselberg’s appearance in person on the banc des accuses is unprecedented. For more than a decade, the one-time holder of a US permanent residency card has fought charges of racketeering and fraud in US federal courts, claiming that he is innocent, and that the US courts have no jurisdiction over the claims. The federal appellate court is expected to rule on whether Vekselberg should face trial shortly. The case against Vekselberg in Switzerland is not new; the civil fraud and criminal proceedings against him by the Swiss market regulator, as well as the criminal agency of the Federal Department of Finance, have lasted for three years. Nor are the repeated attempts made by Vekselberg’s patron, President Dmitry Medvedev, to get his favoured modernizer off the hook of Swiss penal law. Should Vekselberg lose his case in the Federal Penal Tribunal of Bellinzone, he becomes a convicted man. That has immediate impact on Rusal, where he not only holds a 6.4% stake personally, but chairs the company’s board of directors. A Swiss conviction for stock market manipulation should trigger the Hong Kong Securities and Futures Ordinance. That statute regulates all companies trading shares on the Hong Kong Stock Exchange (HKEx), including Rusal since January 27. The Hong Kong rules set out the “fit and proper” standards for company directors and executives, as well as the standards for their disqualification, if they are convicted of offences relevant to their corporate responsibilities and market accountability. The specific rules which Vekselberg and Rusal will have violated if the Bellinzone court upholds the conviction and the fine are spelled out at sections 126 and 129 of the Ordinance. In the case of Oleg Deripaska, chief executive and controlling shareholder of Rusal, he is facing criminal investigation in the courts of Spain, and will shortly go on trial in the UK High Court, charged by his patron and former business partner, Michael Cherney (Mikhail Chernoy), of fraud, contract violations, and cheating him of his 13% shareholding stake in Rusal, plus dividends and profits since 2001. Those proceedings are not yet at the ruling stage. Vekselberg’s fate in the Swiss court is more pressing. The court is expected to conclude the pleadings this week, and reserve judgement and ruling for several weeks. The test for the Hong Kong authorities and the HKEx managers in the Vekselberg case is whether they will hold themselves above the Swiss Financial Market Supervisory Authority (FINMA) – or below it.